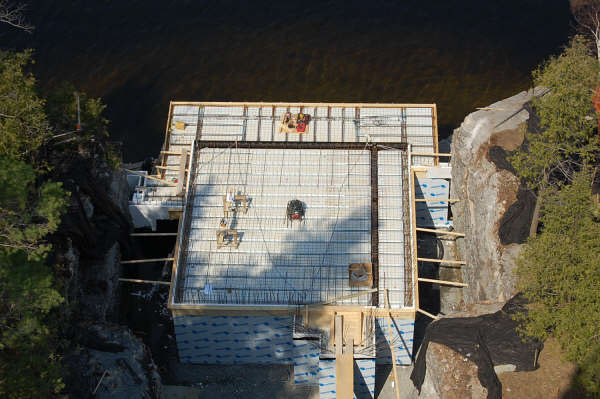 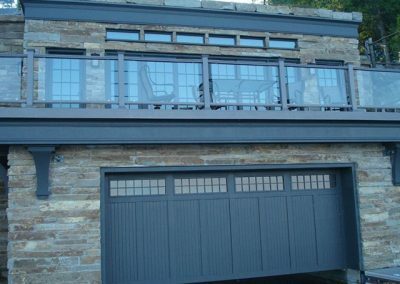 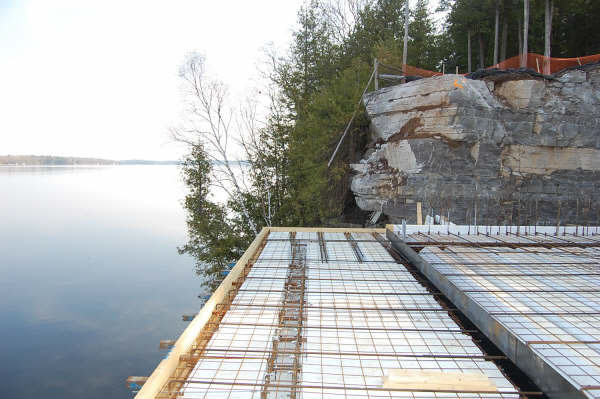 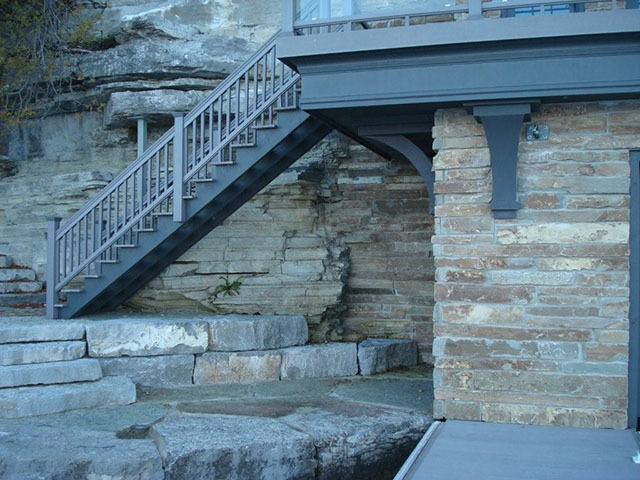 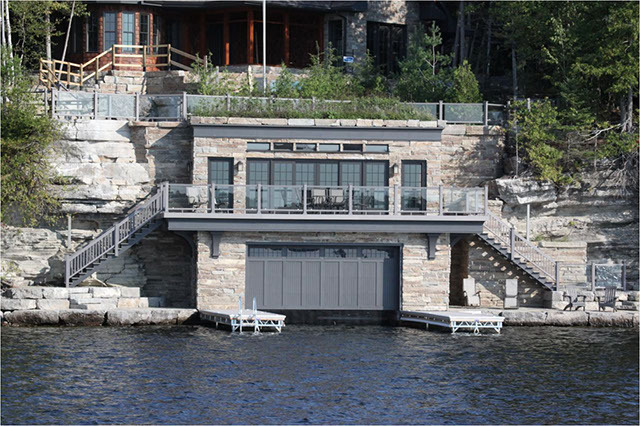 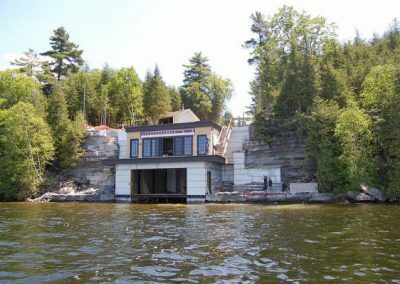 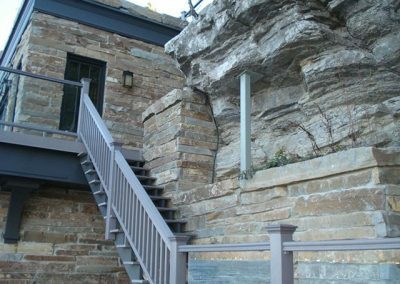 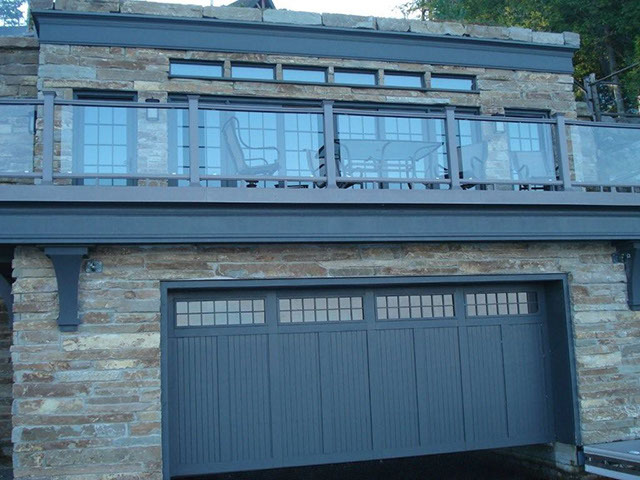 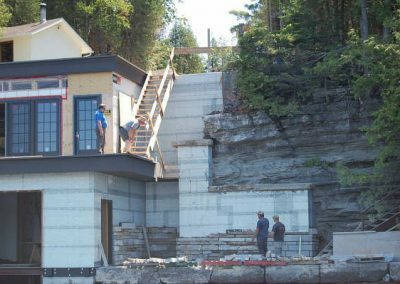 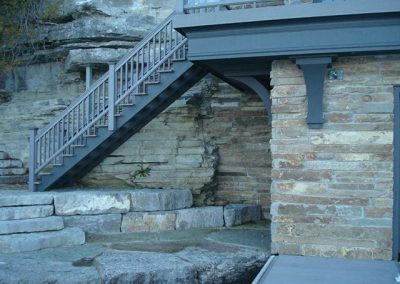 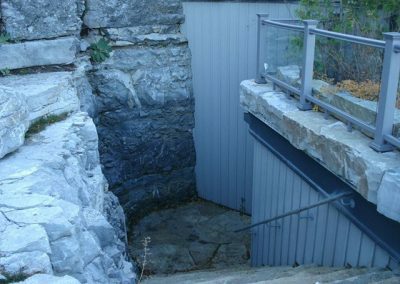 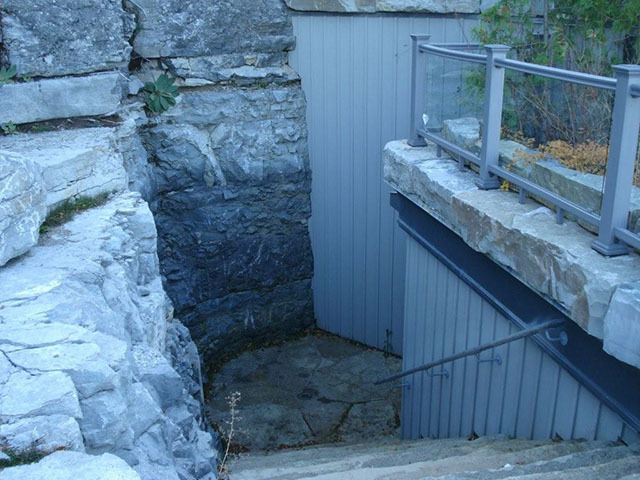 This boathouse with guest accommodations, built into a cliff near Peterborough, Ontario, Canada, is an outstanding example of an environmentally sensitive project that blends premium living accommodations seamlessly with nature. 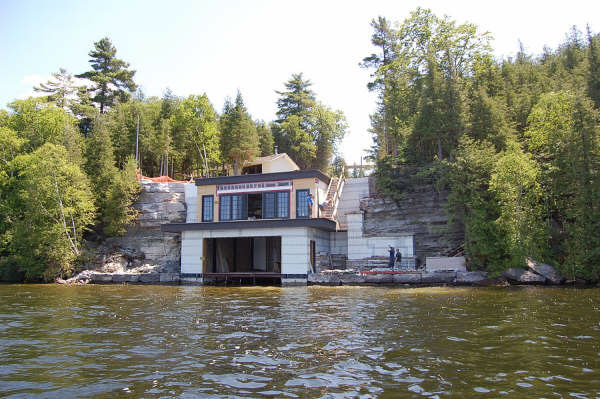 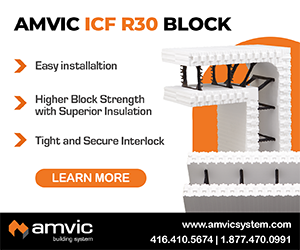 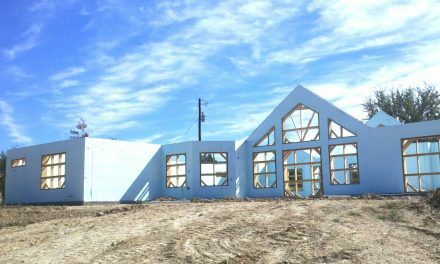 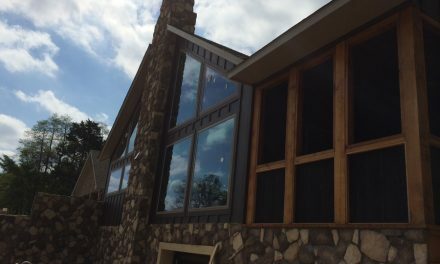 The architect, general contractor, ICF installer, and owner worked together to overcome significant construction challenges to create this milestone ICF project. 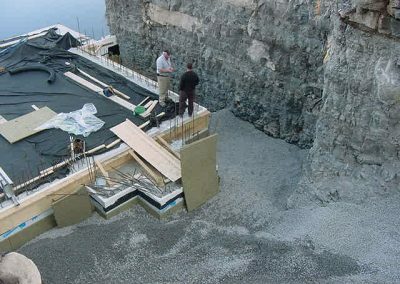 The boathouse was designed to be as unobtrusive as possible, so it was set with its face in line with the limestone cliffs surrounding the lake. 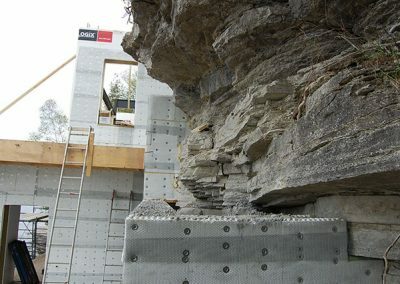 This meant that before construction could begin, an enormous volume of solid rock had to be removed from the cliff. 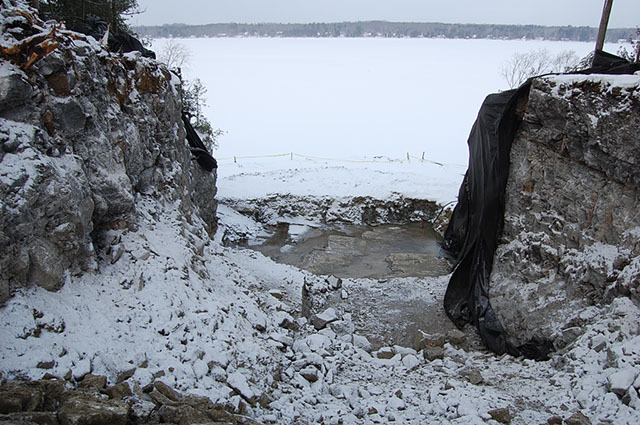 The excavation measured 45’x50’x100’. 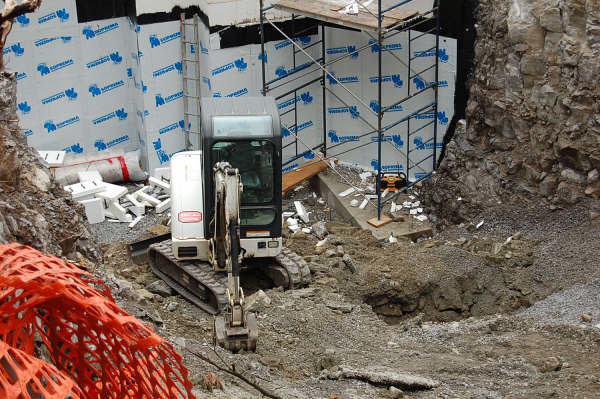 Due to nearby buildings, blasting was out of the question so the work was done with jackhammers and excavators. 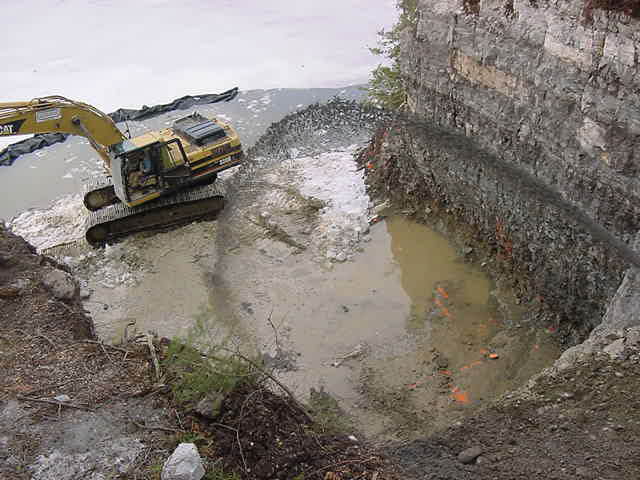 Then coffer dam was built and excavators, a skid-steer loader and other equipment were carefully craned to the bottom of the hole to prepare the footings. 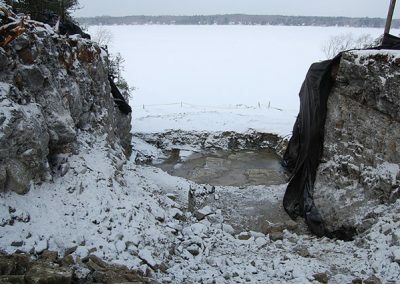 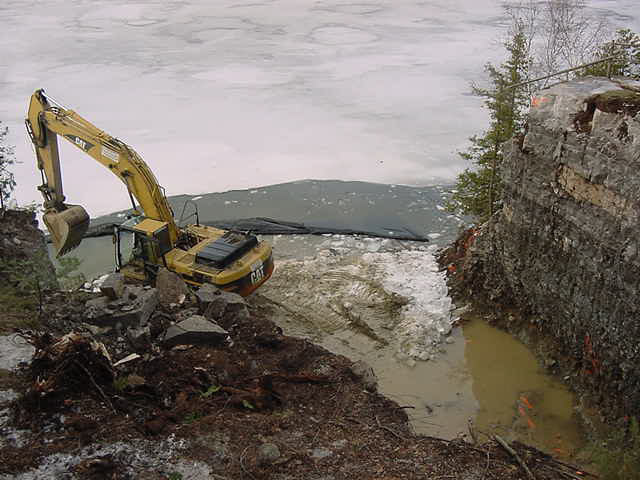 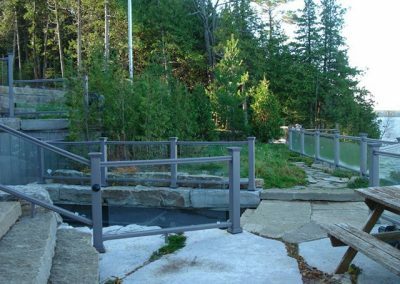 All of this work was carried out in the middle of the Canadian winter, as the lake had to be frozen to avoid damaging the fish habitat. 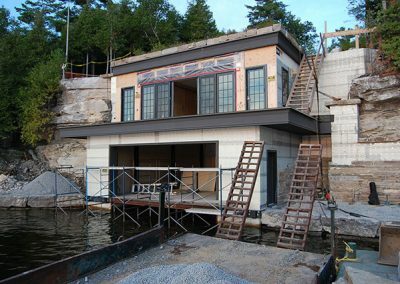 Only when this work was complete could construction begin on the lower lever of the boathouse. 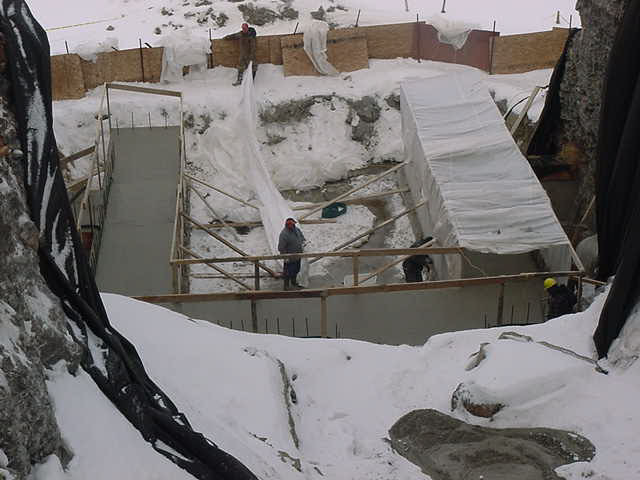 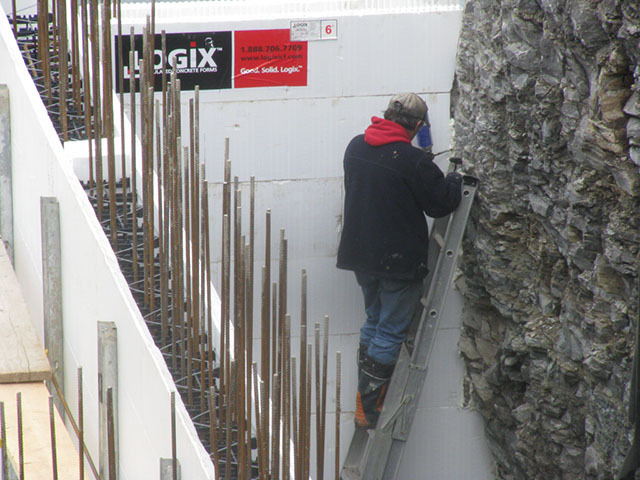 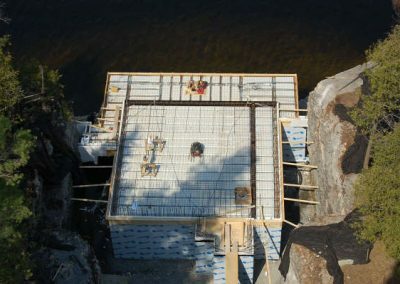 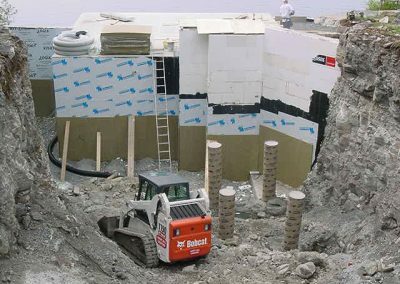 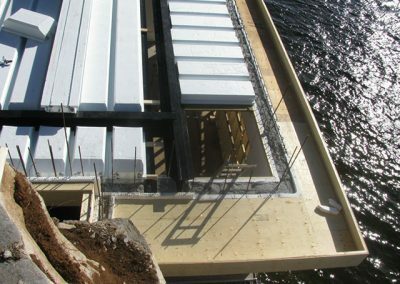 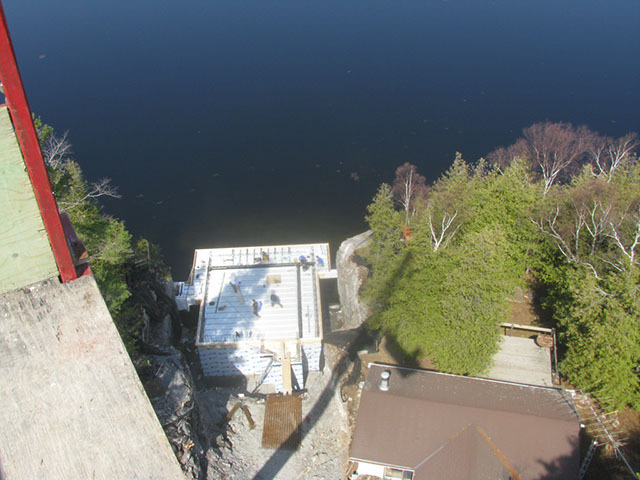 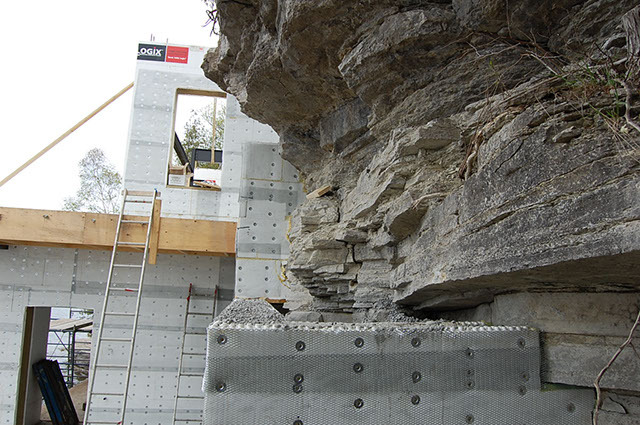 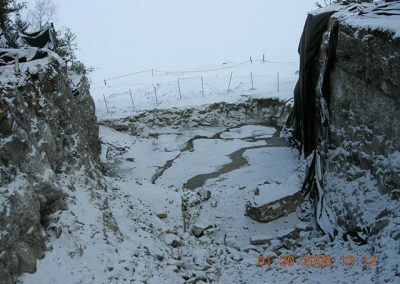 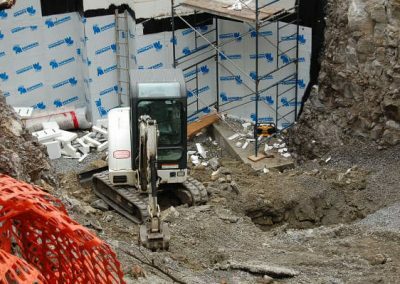 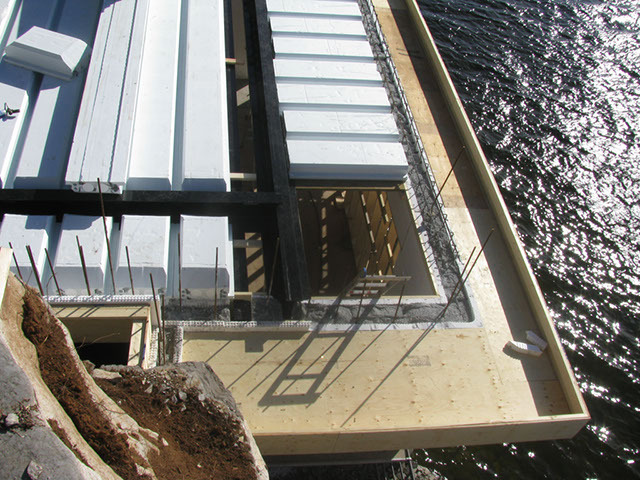 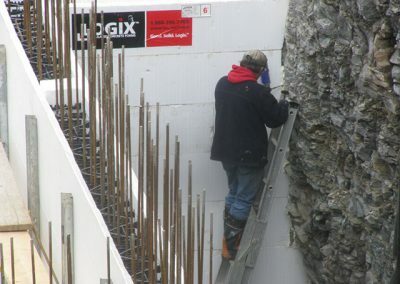 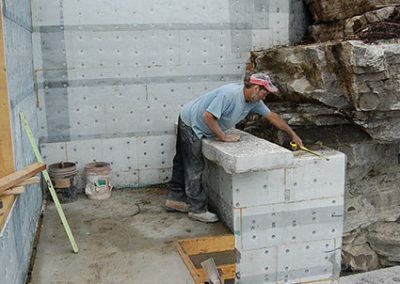 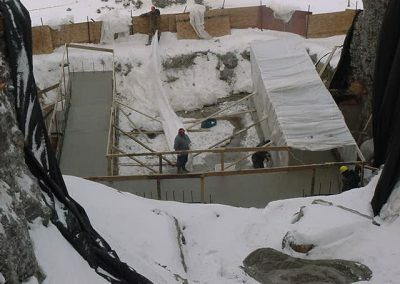 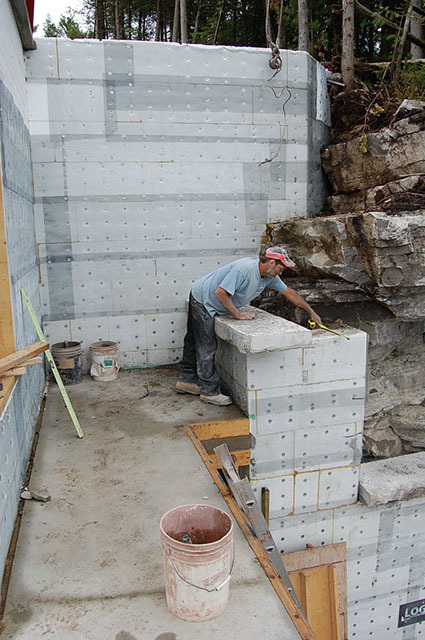 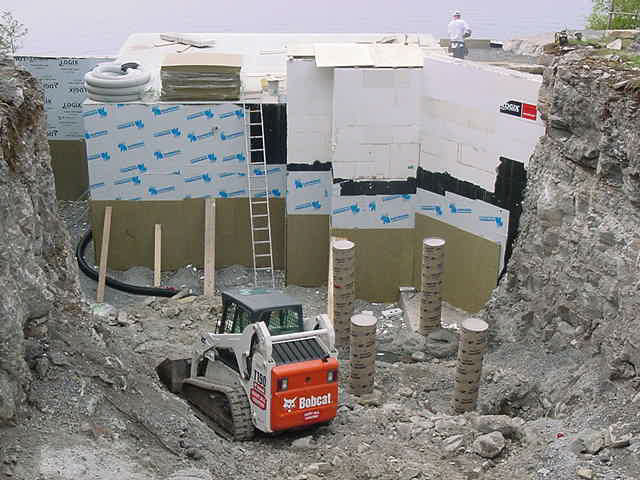 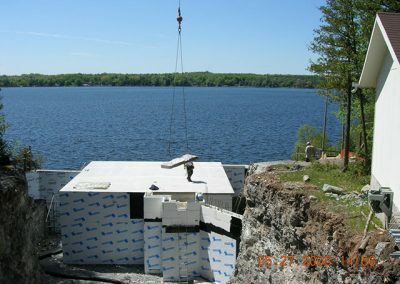 The Logix ICFs were carefully scribed and custom fitted to the cliff walls, then covered with a peel-and-stick waterproofing membrane and backfilled with 1” washed stone. 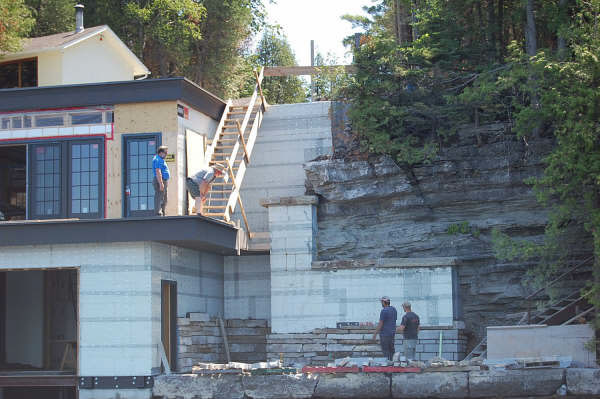 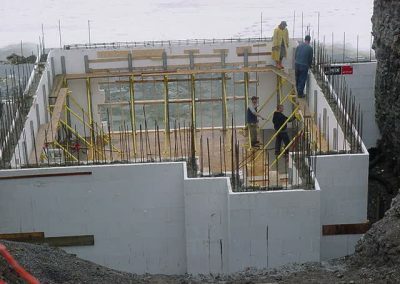 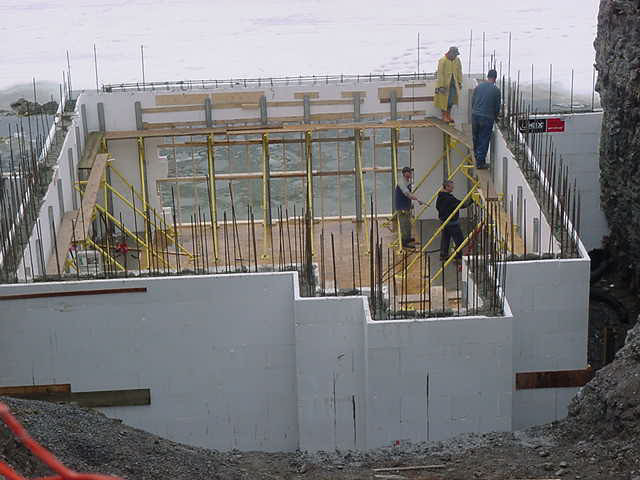 The boathouse walls are 9’4” and the guest quarter above it have 9’ walls; total height of the backfill is 35 feet. 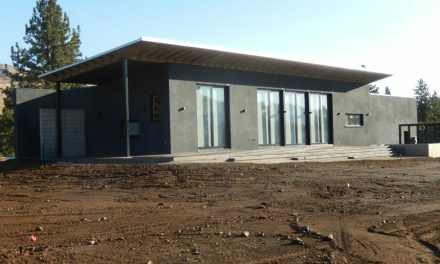 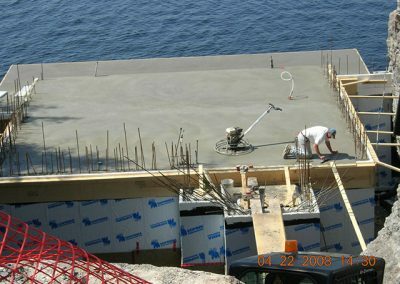 Insuldeck, an EPS/concrete decking system was used for the floor of the guesthouse because of its outstanding thermal value, and for the structure’s roof, to support the vegetated roof assembly. 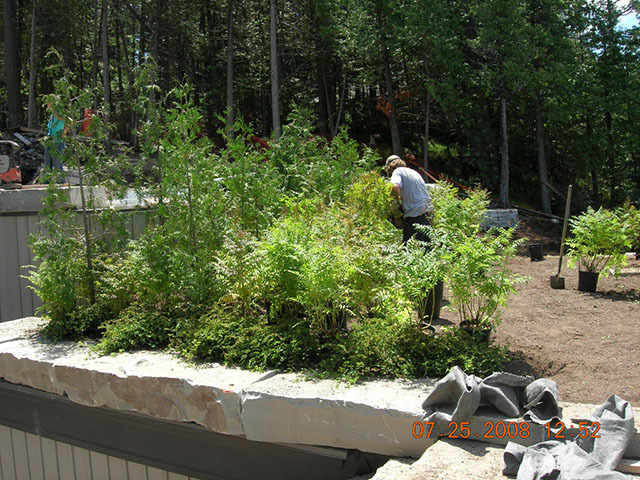 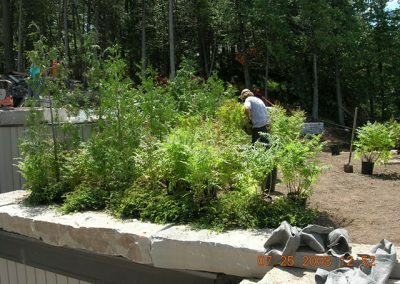 The green-roof, topped by more than two feet of dirt, is planted with spruce,cedar, grass, and native shrubs. 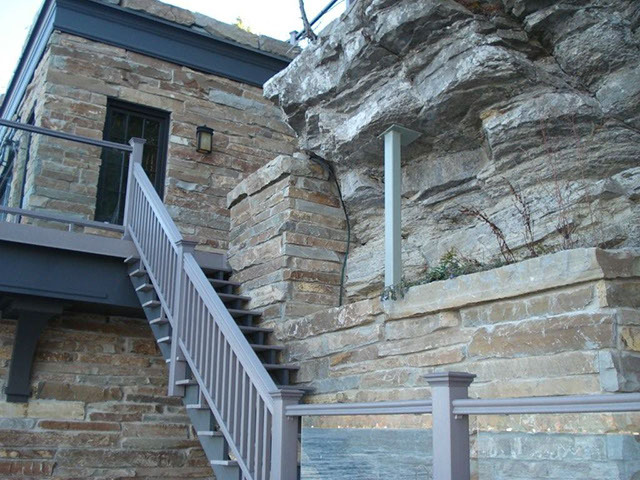 The outside is finished with native limestone that matches the cliff face perfectly. 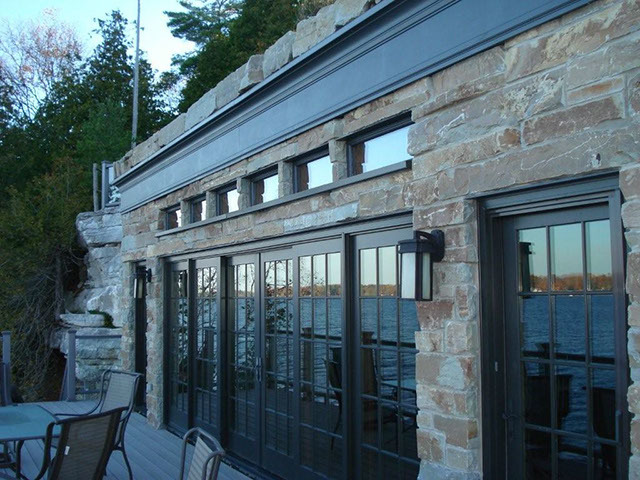 Guests staying at the boathouse have unrivaled views. 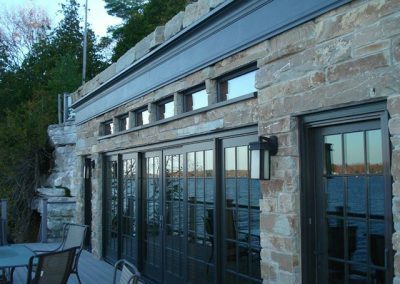 A large bank of windows in the cozy living room allows them to look over the porch to the lake beyond. 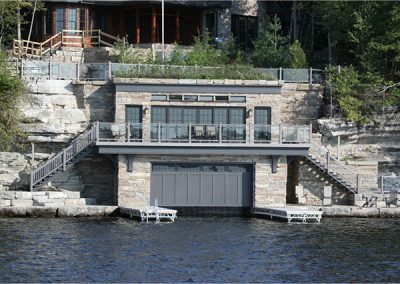 Glass-panelled guard railings provide an unobstructed view of the water. 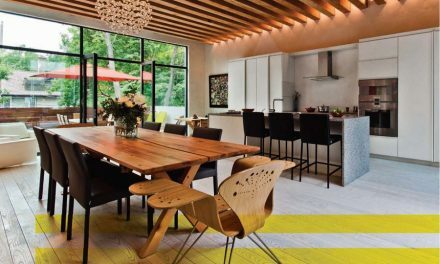 An energy-efficient boiler heats the radiant floor to ensure occupants’ comfort. 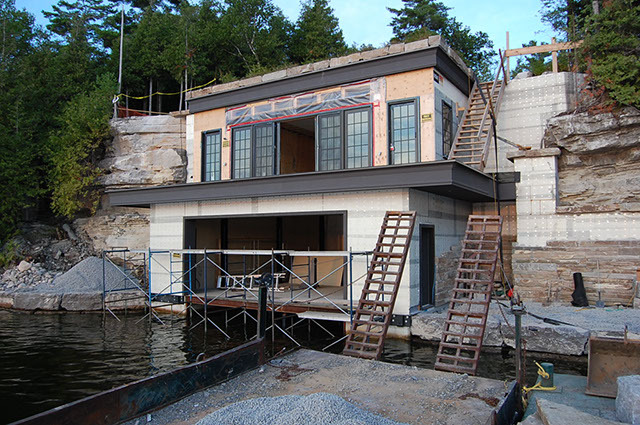 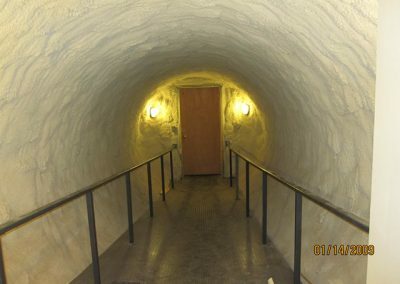 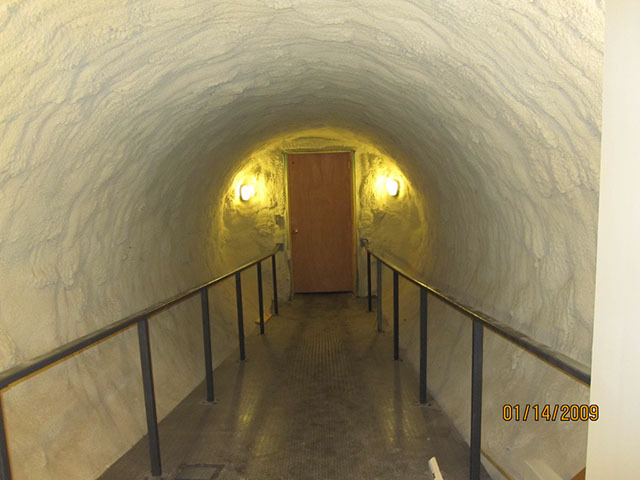 A concealed elevator shaft connects the guest quarters to the lower level of the boathouse, and a tunnel connects the building to the main living quarters to ensure that no one is exposed to the elements when moving between buildings. 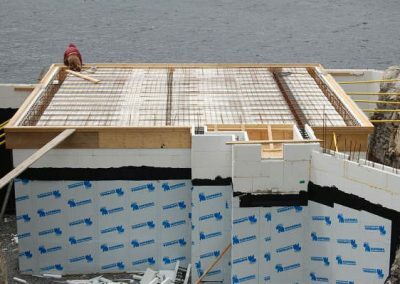 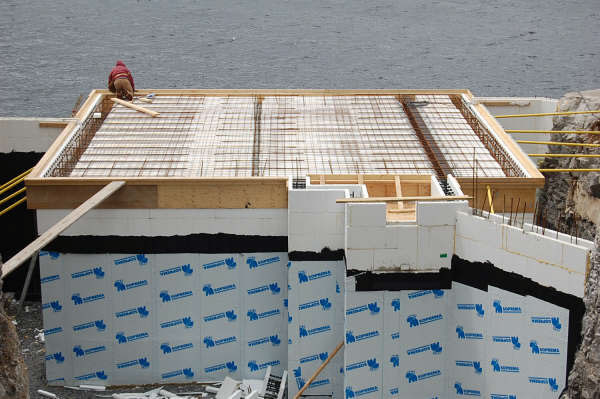 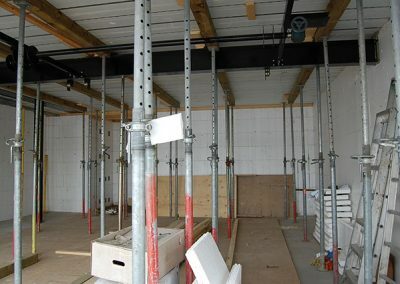 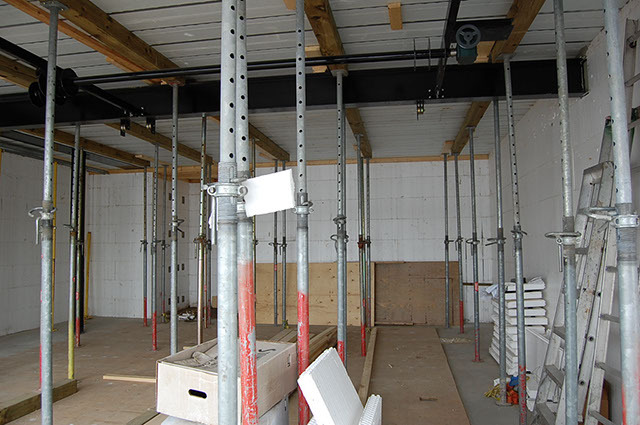 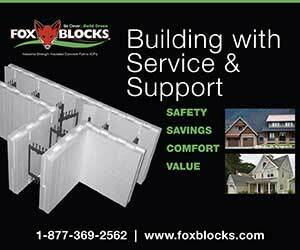 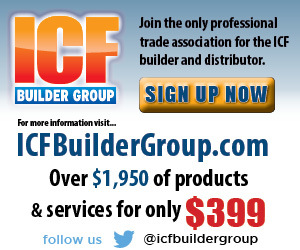 Ken Williams, the distributor who provided the Logix ICFs and Insuldeck, reports that the understated project has gotten the attention of neighbors. 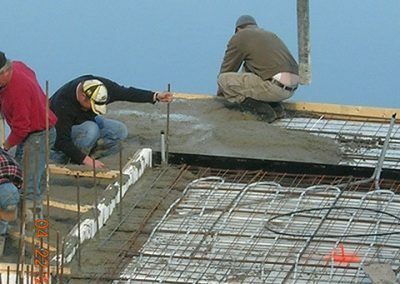 It’s all positive, of course. 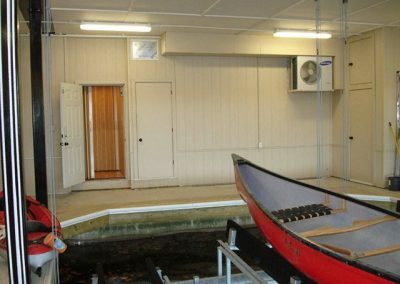 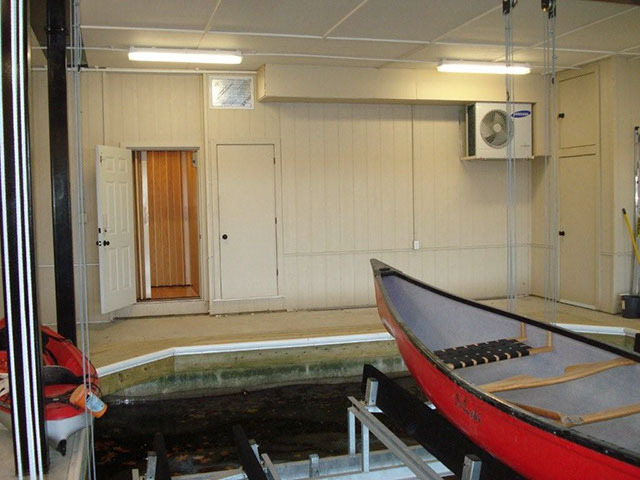 He’s already involved with building two similar boathouse projects nearby. 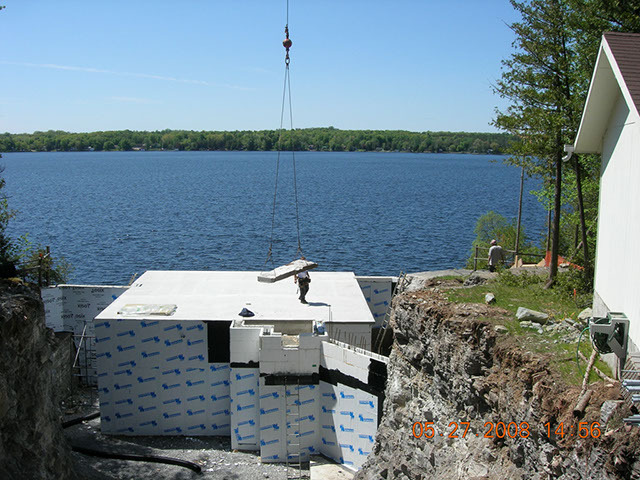 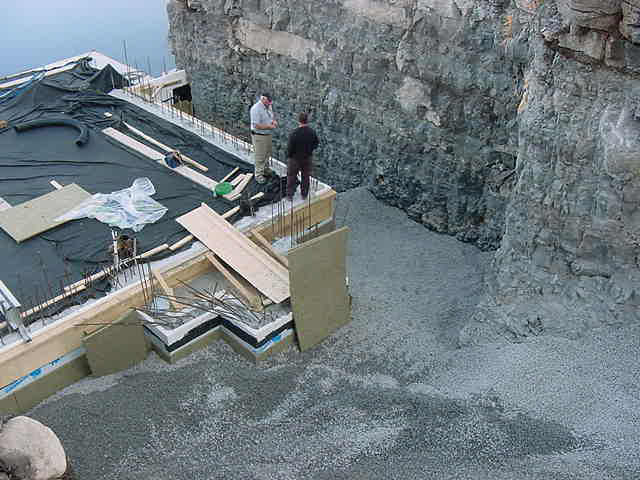 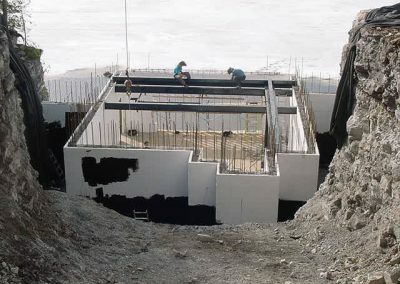 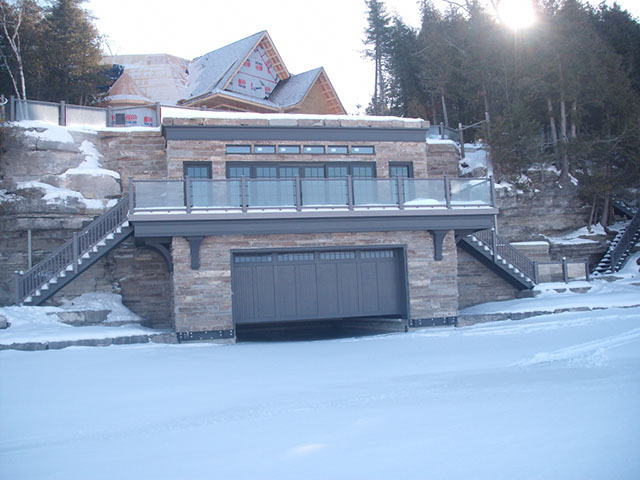 Each ICF was carefully cut to match the cliff face, then covered with a façade of native limestone. 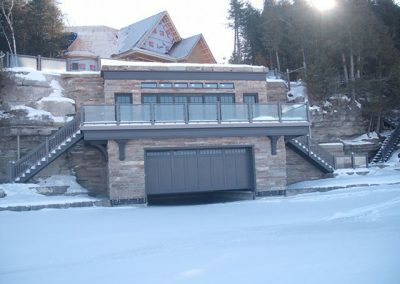 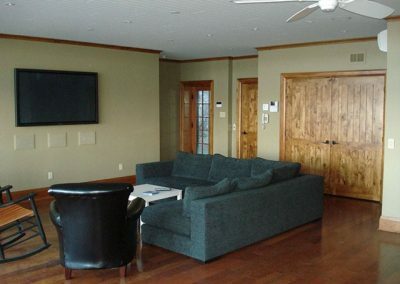 Living space above the boathouse is spacious and comfortable, with a spectacular view of the lake from both the porch and the living room (top right). 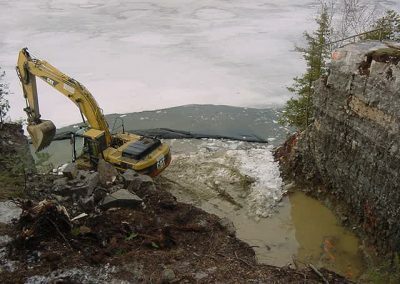 Most of the heavy equipment and supplies came to and from the jobsite via barge. 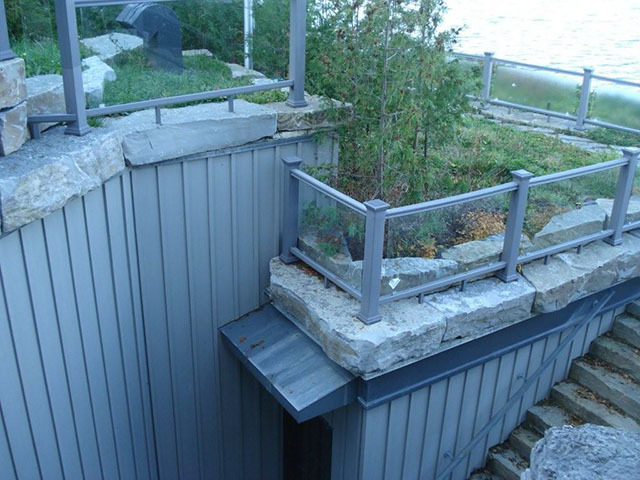 The boathouse blends seamlessly with its surroundings, thanks to a green roof covered with two feet of soil, native grasses and evergreen trees. 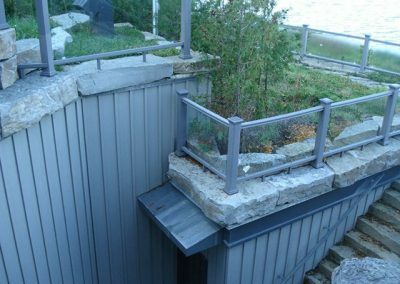 The railing leads to the carefully concealed elevator entrance. 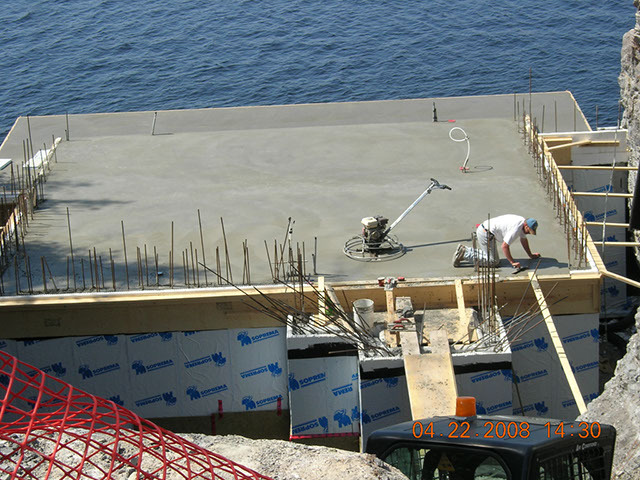 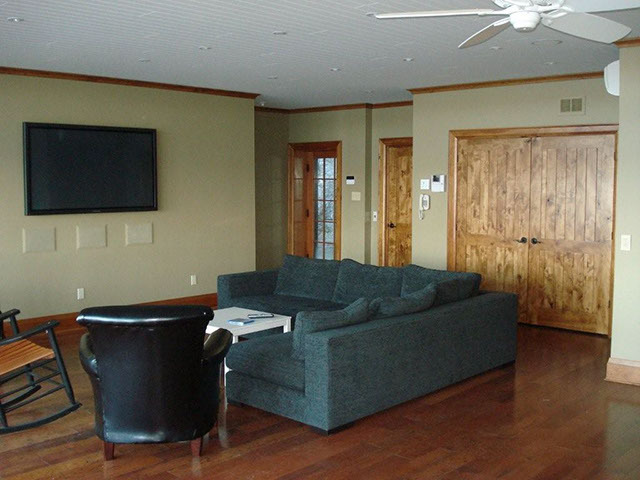 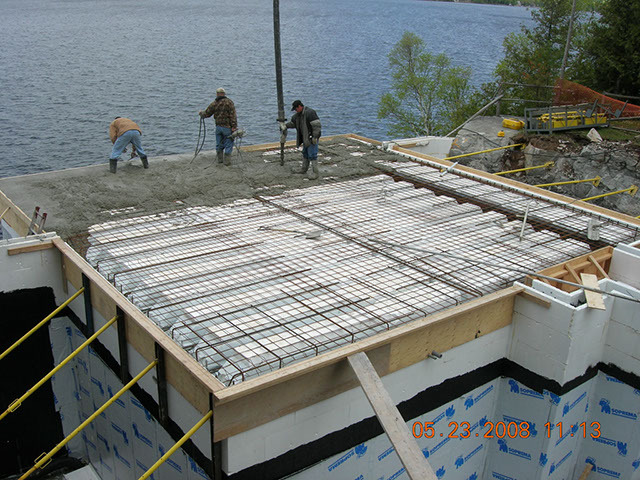 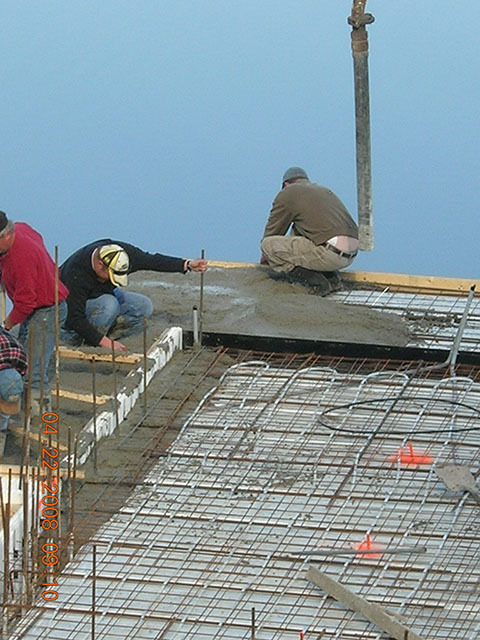 Insulated slab with radiant in-floor heat provides comfortable 2nd story guest quarters.